Another photo with a lot of atmosphere but this time from a recently acquired lantern slide . It shows a platform scene of an unknown era - although I expect well before the First War. The query is, what station? The poster most easily readable mention Easter Weekends - Wilmslow and Alderley - so I suspect somewhere within reach of the Manchester area. Perhaps someone may recognise the layout of what appears to be a headshunt on the left of the image, the style of overbridge, or the station structure itself. If nothing else it does illustrates the type of dress of passengers from yesteryear. 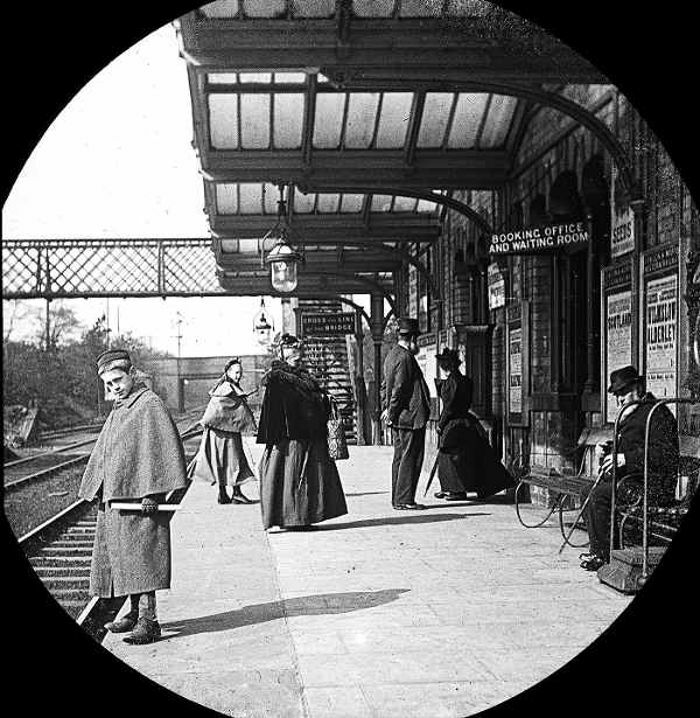 Why is the station thought to be LNWR? This is Worsley, looking along the line from Manchester towards Bolton and Wigan The building, footbridge etc looked much like this when I was a lad. The station brickwork was cream-coloured and there was a small hipped-roof signal cabin - it is partly visible behind the boy on the left; the stair up to the cabin door had only five steps. The station opened in 1864. Stick-up cast-iron lettered signs were introduced from 1878, and when these signboards were taken down in 1950 (for replacement with BR's flat maroon enamel plates) I scraped the letters and found seventeen coats of paint - alternately black and white. This suggests the boards had been repainted every eight years, or more often. Fascinating picture. Alderley and Wilmslow would have involved a trek across Manchester, from Worsley. Scotland could have been accessed with simply a change of train at Wigan [North Western]. I would have passed through the Station during the mid-50�s, on the northbound Windermere Club Train � the 5/10 from Manchester Exchange; as a child, both accompanied and un-accompanied. The southbound train was, I believe, not routed that way. My parents were married in Worsley Church; the spire of which can be seen from the newly electrified Chat Moss route. The photo looks Edwardian in date, or late Victorian. So the smart young lad, is about the age of both my grandfathers! I'd guess the poster for trains to Wilmslow and Alderley was for Easter excursions through to these places, avoiding the awkward change in Manchester and having to walk between Exchange station and London Road. These special trains would presumably go via Manchester Victoria to Droylsden Jct over the L&Y, then back onto the LNWR and south through Stockport to the attractions of Cheshire. Maybe Alderley Edge was a favourite spot for rolling hard-boiled Easter eggs - though we always used the much nearer Rivington Pike for this custom, back in the Dark Ages of the 1940s.